Focusing on knowledge and evidence about the physical, ecological and social mechanisms that underpin global and regional environmental changes, and understanding how these mechanisms have interacted in the past and are likely to change in the future. Emphasis on thresholds and early warnings, synthesis among disciplinary approaches, and new generations of models and their data needs. Focusing on critical knowledge gaps in ways of managing specific sustainable development challenges today, including meeting basic needs, and responding to emerging priorities in the UN post-2015 development agenda. Emphasis on integrated, co-produced knowledge to examine the effects of global environmental change on poor people, the nexus among basic needs for human well-being, growth strategies in relation to sustainable production and consumption, urbanisation, and governance for global sustainability. Focusing on the critical knowledge gaps in how societies might address global environmental and sustainability challenges through transformative change. It helps to identify socio- cultural, economic, institutional and political barriers and opportunities, and the mechanisms needed to promote sustainable development pathways linking economic prosperity with social justice and a healthy biosphere. Emphasis on observation and assessment of societal transformations, the trade-offs and conflicts inherent to transformation processes, and factors influencing transformation pathways. The Research Agenda also calls for a novel way of doing science. This approach is detailed in the Future Earth 2025 Vision and includes a strong emphasis on full integration among scientific disciplines, on engagement with societal partners in co-designing and co-producing knowledge, on international collaboration, on producing knowledge that is valuable to decision-makers, and on generating the solutions that society needs. The research priorities that have been co-designed with stakeholders from civil society, and from the funding, business and policy communities. It has been written by the Science Committee and interim Engagement Committee, and was created at the request of the Belmont Forum, a member of the Science and Technology Alliance for Global Sustainability which sponsors Future Earth. The Research Agenda is intended to inform researchers and funders across different domains, disciplines and regions of the world, by providing key priorities for the next 3–5 years which can be used as starting points for the development of research strategies and funding programmes. 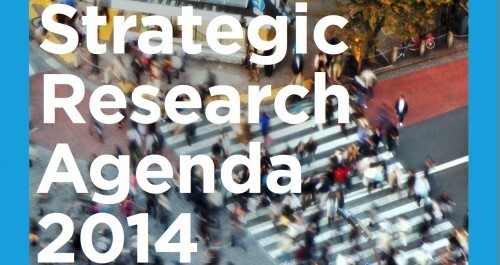 View the Future Earth Strategic Research Agenda 2014, and read more about the Agenda and Future Earth.